Electric flight is really taking off. Part of the reason is the ready availability of high quality electronic speed controls for nearly any desired application. There is also a great deal of information and misinformation about these useful devices. This article is an introduction to the basic operation of speed controls, and will describe some of the many features available. This article only addresses speed controls for conventional brushed motors. Although some of the same principles apply to brushless motor controls, their design and operation are very different. We will use this equation to compute the power loss in various speed control schemes. Early electric R/C car speed controls consisted of nothing more than a hefty variable resistor, the wiper of which was moved by a servo. This had the advantage of being simple, but was very inefficient at partial throttle settings. Such a control works by reducing the voltage to the motor, but this means that any voltage that does not appear across the motor terminals must appear across the speed control. For example, at half throttle, a resistor speed control that is controlling a motor drawing 10A from a 6-cell pack will have 3.6V across it, and 10A flowing through it. From our second law, that’s 36W, which all becomes useless heat. This would be like running a 40W light bulb in the radio compartment of your plane. Furthermore, half the power being produced by the battery is being wasted. A resistor speed control is only efficient at zero throttle (when no current is flowing), and at full throttle (when there is no voltage drop across the speed control). A typical (in 1997) high-rate analog speed control connected to a Graupner Speed 600 motor. Notice the fuse in the positive lead from the battery connectors. An electronic speed control (the photo shows a typical high-rate speed control) works by applying full voltage to the motor, but turning it on and off rapidly. By varying the ratio of on time to off time, the speed control varies the average voltage that the motor sees. Since at any given instant, the control is either fully off (no current flowing, so P = 0 × V = 0W) or fully on (no voltage drop across the speed control, so P = I × 0 = 0W), this kind of control is theoretically 100% efficient. In reality, electronic speed controls are not 100% efficient. Ignoring the factors introduced by switching rate (discussed later), the loss in efficiency is due to the fact that the components doing the actual switching are not perfect. They are not mechanical switches, and therefore have significant resistance. Whenever there is current flowing through a resistance, there is power loss. Some early electronic speed controls used ordinary (bipolar) transistors to switch the motor current. These generally have a 0.7V drop, regardless of the current flowing through them. This means a power loss. For example, at 20A (full throttle on a small 05 sized sport plane), this would result in a 14W loss (P = I × V = 20A × 0.7V = 14W). Modern speed controls use MOSFETs (Metal Oxide Semiconductor Field Effect Transistors). Rather than having a fixed voltage drop like a bipolar transistor, a MOSFET has a fixed resistance when turned on. Therefore, the voltage drop depends on the current flow. A typical MOSFET used in inexpensive speed controls has 0.028 Ohms resistance. Using Ohm’s law, we can determine the voltage loss. At 20A, this produces a 0.56V drop (V = I × R = 20A × 0.028 Ohms = 0.56V). We can use the second law to compute that the power loss would be 11.2W (P = I × V = 20A × 0.56V = 11.2W). The power loss can be reduced by using more MOSFETs in parallel, or using modern lower resistance MOSFETs. For instance, an Astro 211 speed control has a resistance of only 0.002 Ohms. At 20A, this would result in a 0.8W power loss. If it were being used with 10 cells at 20A, that would be less than a 0.4% loss (10 cells at 20A produces about 220W). The rate at which a speed control turns the motor on and off is also rather important. Early speed controls, including some still made today, were low-rate controls. These turn the motor on and off at the same rate that your radio sends pulses to the servos (usually 50 to 60 times per second). The simple theory presented above breaks down at these low rates, and such speed controls are very inefficient at partial throttle settings. There are many technical reasons for this, involving factors like motor coil inductance, impedance, and so on. There is also one simple reason, and that is bad timing. Consider a typical low-cost motor with a three slot armature. As this motor rotates, each of the three commutator segments passes each brush three times per revolution. Each armature winding is energized in a given direction once per revolution. Now suppose that the speed control is being operated at 1/3 throttle (so it is on 1/3 of the time and off 2/3 of the time), and that this results in the motor turning at 60 revolutions per second (3,600 RPM). If the speed control is pulsing the motor 60 times per second, then each pulse corresponds exactly to the beginning of one revolution. Since the power is on only 1/3 of the time, only one armature winding is energized in each revolution, and it will always be the same one. Therefore, this one winding is doing all the work, and will get much hotter than if the work were shared by all three windings. The rotation will also not be smooth, as the motor accelerates and decelerates with each revolution. If you used such a speed control with a geared motor, the gears would take quite a beating and quickly wear out. Modern speed controls turn the motor on and off at a much higher rate (typically 1,000 to 4,000 times per second, with 2,500 being typical). Even at 1,000 cycles per second, the problem described above would not happen until the motor reached 60,000 RPM, which is beyond the reach of most motors. This results in much smoother operation, and due to a better match of the switching frequency to armature winding characteristics, results in less heat loss within both the motor and the speed control. A brake forces the motor to stop turning once the speed control stops delivering power. Electric motors become generators when being driven by their output shaft (for example, by a wind-milling propeller). The more load you put on a generator, the harder it is to turn. A speed control brake simply places a load (a low resistance) across the motor terminals, making it difficult for the motor to turn. This is generally sufficient to stop it completely. If a folding propeller is being used, this will allow it to fold. If a fixed propeller is being used, it will produce less drag than if it were spinning. This term describes both speed controls and a special kind of on/off-only motor switch. In both cases, it indicates that the control will go from off to full throttle slowly (for example, over the course of one second) instead of instantly. This is very important if using a gearbox or folding propeller, since an instant start can strip gear teeth, or shear propeller hinge pins. Some speed controls let you adjust the soft start time interval. Until fairly recently, the majority of speed controls were analog, meaning they worked with voltages and pulse widths, and had dedicated circuitry to perform each of their functions. Most modern speed controls are digital. These controls use a microprocessor to measure the incoming pulse with from the radio, and to generate the pulses to the MOSFETs. Digital designs have the advantage of being adjustment free, and of being able to provide sophisticated safety features. For example, most digital controls will refuse to turn on until the throttle stick has been moved completely to off first. 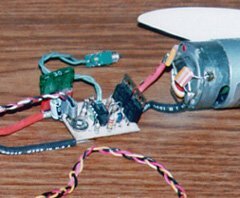 In small planes, it is advantageous to eliminate the weight of a receiver battery. Many speed controls provide a BEC feature that provides power to the receiver and servos from the motor battery. There is still a great deal of debate as to whether this is safe, primarily due to the danger of electrical noise getting into the receiver and causing reduced radio range. The other danger of course is that the motor battery could run down to the point that the BEC cannot provide power to the receiver. BEC is very popular with the electric pylon racing crowd, where the planes never get very far away, and land immediately after the race. This feature is generally used with a BEC, so that the motor will shut down before the battery is depleted, thus reserving some power for the radio. To reduce the possibility of the speed control interfering with the radio receiver, some controls use an optoisolator chip. This is basically an LED (light emitting diode) and phototransistor encased in plastic. The signal from the receiver drives the LED, which optically transfers the signal to the rest of the speed control. There is no electrical connection between the receiver and the main part of the speed control. Obviously, this eliminates the possibility of providing a BEC. Most speed controls operate over a range of cell counts, such as 6 to 12 cells. You must choose a control that covers the range with which you want to use it. Do not go below or above the manufacturer’s specified range, or you will damage the speed control. Determine the current draw that you will get at full throttle. If you have no idea, you can measure it on the bench (without a speed control, although this is hard on the gearbox if you will be using one). Alternatively, consult with the manufacturer of your motor, or with other modellers. You can also use one of the motor performance prediction programs, like MotoCalc or ElectriCalc, to get fairly accurate predictions. Many speed controls have both a continuous current rating (the current level that the control can handle indefinitely), and a peak current rating (the level it can handle for a short time, usually less than 30 seconds). For sport flying, select your speed control based on the continuous rating. This rating should be higher than or the same as your expected maximum current draw. Be careful if you are considering any of the R/C car speed controls. Most of these have grossly overstated continuous current ratings. For example, one popular control is advertised to have a 250A continuous rating, when in actual fact it would fry in seconds at 80A. The size of your motor compartment and the size of your plane will affect the size and weight of speed control you can fit in. When determining the weight of the speed control, be aware that some manufacturers state the weight with the motor and battery leads, and others without these. For many of the newer miniature controls, two pairs of 6 inch 12 gauge leads can easily weigh more than the rest of the control. Note that most of the car speed controls are two to four times the size and weight of a good quality aircraft control, and are thus generally unsuitable for our use. Whether or not you want or need a BEC depends on the application. If you are flying an electric glider and you want to climb until you are out of power, and then glide for a long time, you do not want a BEC. On the other hand, if you are running 4 minute pylon races and will land immediately afterwards, you probably do want a BEC. If you want a BEC, be sure to select a control with an automatic cut-off. When choosing a speed control with a BEC, note that many controls will provide the BEC over a smaller range of cell counts than the control would otherwise work at. For example, the popular FX35D from Ai/Robotics will provide a BEC only for 6 to 10 cells. A brake is a necessity if you are flying a glider and you want the propeller to fold when the motor stops. For other applications, a brake is not necessary, but will do no harm. It is actually better for a propeller to stop spinning than to free wheel, since it creates less drag that way. If you are using a gearbox, you will want a speed control with soft-start. Fortunately, almost no speed control is capable of going from full off to full on instantly. Most of them have a soft-start, and even if the one you choose does not, you can get the same effect by not slamming the throttle stick to full power. Optical isolation is only worthwhile if a non optically isolated speed control is giving you radio interference trouble that you just can’t solve, or if you are operating at extremely high currents, such as those found in an F5B class sailplane. Very few inexpensive speed controls provide optical isolation. Installation of the author’s high rate speed control with brake in the nose of a modified Great Planes Spectra. Again, notice the fuse in the positive battery lead. The motor is a Great Planes Goldfire, reworked with a car motor end-bell and replaceable brushes, turning a Master Airscrew 12×8 folding propeller through a 2.5:1 gearbox. Current draw is about 30A, and the speed control barely gets warm. Installing a speed control is simple (see the photo at right for an example), provided you follow the manufacturer’s instructions. Pay special attention to the details of motor interference suppression. Doing this properly can make the difference between perfect operation and an unusable speed control. Interference suppression, using a 0.1µF and two 0.047µF capacitors. Also notice the diode just below the rear motor bearing. 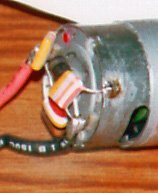 If there are no instructions about interference suppression, solder a 0.1µF 50V capacitor between the two motor terminals, and a 0.047µF 50V capacitor between each terminal and the motor case, for a total of three capacitors (see the photo at left). Many speed controls also require you to install a Schottky diode across the motor terminals. Install this diode with the banded end towards the positive terminal. The diode is an important part of the efficient operation of the speed control, and those that do not require one will already have one installed on the control itself. Finally, if you are using a speed control with a BEC, do not install the fuse between the battery and the speed control; do install it between the speed control and the motor. Otherwise, if your fuse blows, you will lose control of your aircraft since the radio will no longer have power. Do you know of any brushless DC motor controllers? Not the pre-built, but one you can build yourself. I have been looking for something with a PIC micro controller as the foundation. I have seen one of German design using an AVR but I can’t locate the software. Thanks Ken. This article is absolutely great. I mean really great. I would request to make some more example could be added to make things more attractive. Simply GREAT article!!! I had many doubts you just cleared out so easily! Thank you very very much!!! Thank you Stefan; your articles and explanations on these circuits are the best around on the subject! Concise and clearly explained. To make your own speed control, look at the articles listed under “Building Your Own”. This is pretty sweet. I might try and build one just for fun. Very helpful and fuel my passion of Electronics again after many years! Stan, they currently are not, but I had been thinking of making them available as a Kindle e-book. Would like to use extracts from your web site, fully credited, in a magazine article. Please contact me, could not find any other “contact me” link on your web site. PS I think we may have corresponded in the past about our mutual love of slide rules? If not we should! but currently i am trying to drive the BLDC motor using 555 timer for the input of PWM pulse to ESC but motor is not responding can you tell is it possible to drive the motor using 555 timer. Mohit, I assume you’re using an appropriate brushless speed control? If so, yes, you can drive with a pair of 555 timers. The speed control is expecting a series of +5V pulses ranging in width from 1ms to 2ms, and occurring every 20ms. hai stefan, how do we know the amount of resistance in each ESC? It’s part of the specifications of the ESC. The manufacturer should provide this information, but they often don’t. The 0.7 Volt drop you mentioned for a bipolar transistor is for the Base Emitter junction of the transistor but the current is flowing from the emitter to the collector and that drop is much less. Typically well under 0.1V. I have enjoyed your site very much. Keep up the good work.